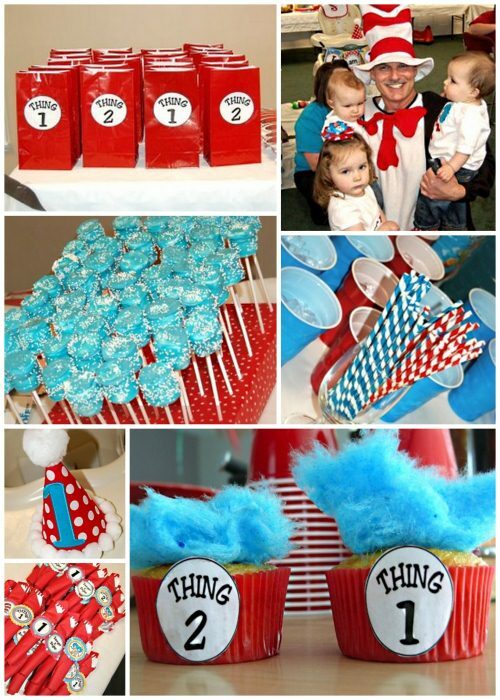 Thing 1 and 2 Party Ideas for kids. This is a favorite for boys and girls alike and are a fun birthday idea for twins. I'd like to give a special thanks to Kyla for sharing her wonderful party ideas! This is such a fun theme with so many cute possibilities! This is such a fun theme with so many cute possibilities! 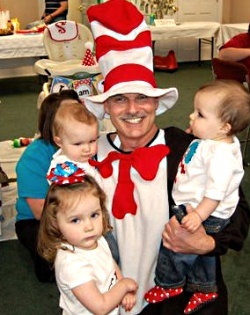 Have an adult dress up as Cat in the Hat. 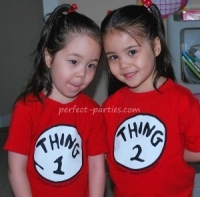 Thing 1 and 2 shirts are perfect for this occasion. For those of you who are creative, here is a cute dress up ideas...make your own special party hats for the birthday child. 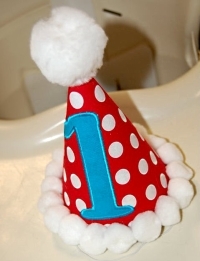 This was made with an embroidered "1" and some white pom poms and cute fabric. Perfect for a First Birthday theme. How about a blue wig to go with the shirts! Read the description carefully about sizing if it is for a child and read the helpful Q and A. Cute Party Banner! 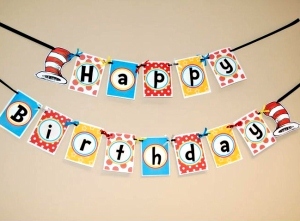 You can make birthday banners with cardstock and computer printouts. I've seen some cute ones for sale on Etsy too. Decorate your tables with white, blue or red tablecloth. See the collage above for some cute favor ideas. Shown are some cute red favor bags...fill with bubbles, goldfish packs and other small treats. 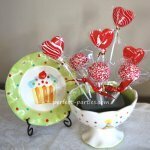 Put the marshmallow lollipops in lollipop bags and secure with a red or blue ribbon to take home as a favor. 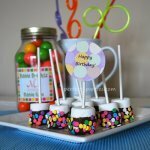 Make cool Marshmallow Lollipops like in the photo above. 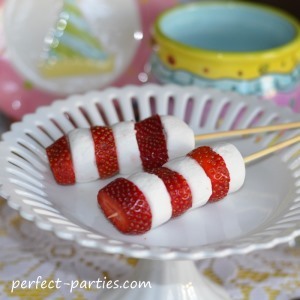 Strawberry and Marshmallow strung on Lollipop or Cookie Sticks. We used skewers which I wouldn't recommend with young children. Popcorn in red or blue funnel shaped cones or cups. Pin the Blue Hair on Thing 1. Have a large cutout of Thing 1 and get some blue felt, blue cotton, to pin on Thing 1. Go Fish is perfect for all ages so it's perfect for that mixed age party and everyone is a winner! This can also be your goody bag favor if you don't care for making individual bags and filling them. Win a Goldfish game. Find cups and containers and ping pong balls at Dollar Tree, craft stores or WalMart craft sections. Line up on a table and toss ping pong balls into the containers. Winner gets a goldfish. Put goldfish in small containers with distilled water and cover. Attach a small bag of fish food and fish care if you desire. 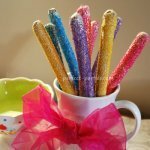 This also can serve as your party favor! "You will see something new. Came Thing Two and Thing One!"